PENTHOUSE! If you love views from almost every room in the home this is for you! Lovely finishes throughout. Walk into the foyer w/ hardwood floors & inlaid marble. 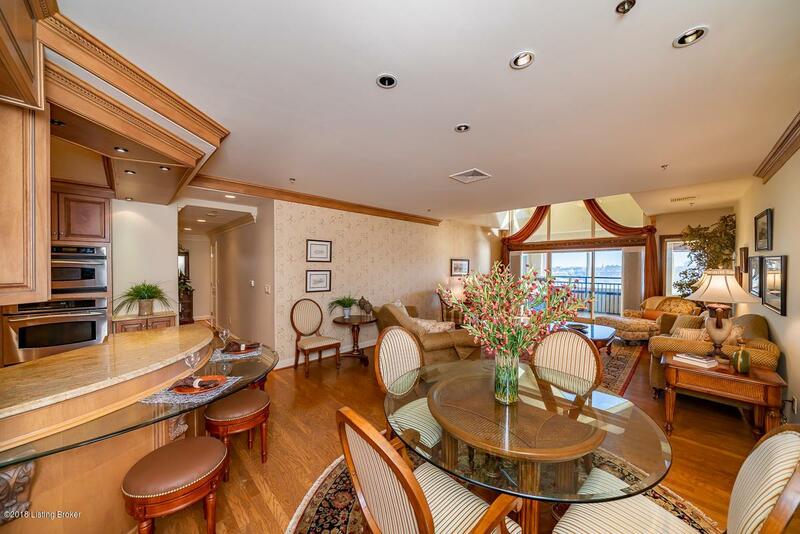 The open living area features hardwood floors in the living, dining, kitchen & hallway. Vaulted ceilings in the living room have additional windows only available in a penthouse. 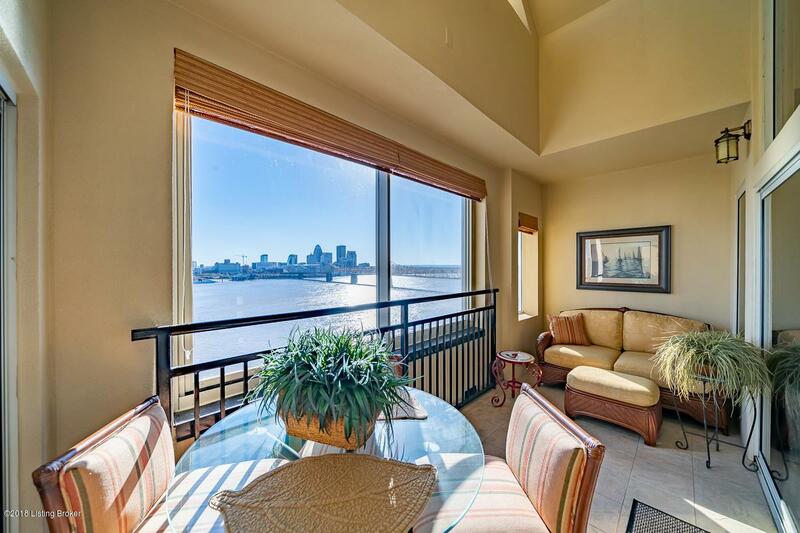 The living room opens up to an enclosed balcony w/ sliding window allowing use through all seasons. The kitchen has abundant cabinets w/ custom wine & plate racks, separate cooktop, range & Stainless Appliances. The kitchen granite has a curved glass breakfast bar. The master bedroom is set up to focus on the skyline view & has access to the covered patio.The master bath features a walk-in shower w/ multiple shower heads, soaker tub, double vanities, water closet & walk-in closet. The master has a den with custom built-ins & can also serve as a 3rd guest room. The 2nd bedroom shares a Jack-n-Jill bath w/ the den/3rd bedroom. Each bedroom has its own vanity & share a tub/shower. There is also a half-bath for your guests. Deeded parking spaces 361 &362. 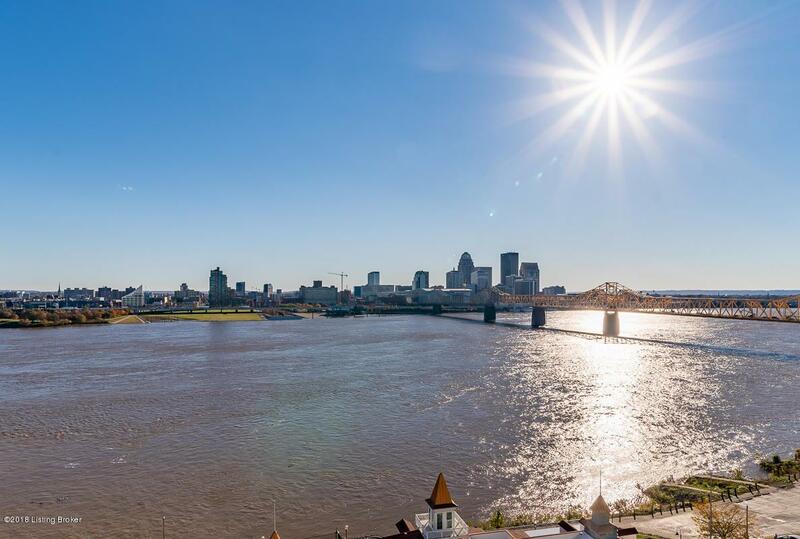 Premier location for Thunder Over Louisville w/ the everyday convenience of walking to multiple restaurants & entertainment options. Harbours is a premier property with gated entries, fitness center, indoor & outdoor pools, grills on-site, patio/gazebo areas. Monthly HOA covers amenities, cable, high speed internet, HBO, Showtime, water, sewer, trash & master insurance.